The Energy Policy Act of 2005 extended Daylight Saving Time (DST) in the United States by four additional weeks. Starting in 2007, Daylight Saving Time begins on the second Sunday in March and ends on the first Sunday in November. If you use the QTIMZON system value, IBM has issued the following Program Temporary Fixes (PTFs) that add time zone descriptions to comply with the new rules for 2007 and beyond. After you apply the appropriate PTFs for your OS level, you can change the QTIMZON system value to the new value for your region. Note: Continue to check with IBM in the event that future PTFs become available. Note: If your system uses a Hardware Management Console (HMC), you might need to apply additional fixes. If the HMC code is at version 6.1 or version 5.2.1, no additional fixes are required. Previous releases of the HMC code require additional fixes to support the changes in DST. Check with IBM for a list of PTFs that might apply to your HMC. IBM introduced the QTIMZON (Time Zone) system value with OS/400 V5R3. The QTIMZON system value has a type of *DATTIME and automatically changes the system time to or from Daylight Saving Time on the appropriate day and time. Use the IBM i command, WRKTIMZON, to see information about various time zones. The time zone description currently specified in the QTIMZON system value is indicated by a greater than symbol (>) on the display. Select option 5, Details, for a time zone to see the dates and times when the system time will change for daylight saving time. For example, the time zone value for the Central time zone is QN0600CST2. The default setting for this time zone value changes the time from 2:00 a.m. to 3:00 a.m. on the second Sunday in March and from 2:00 a.m. to 1:00 a.m. on the first Sunday in November. Note: IBM also added a time adjustment feature in V5R3. This runs through the IBM i Navigator and cannot be automated. If you use this feature while Robot Schedule is active, run times are skewed. Therefore, we do not recommend using the time adjustment feature. In the Robot Schedule GUI version 12.13 and above, you can select a field called Enable Daylight Saving Time automation if you want your jobs to run at their scheduled run time on the day Daylight Saving Time starts without having to end and restart the product. Within the Robot Schedule GUI, right-click System Defaults in the Tree view and select Properties to display the General System Defaults window. On the Default Options tab, select Enable Daylight Saving Time automation. 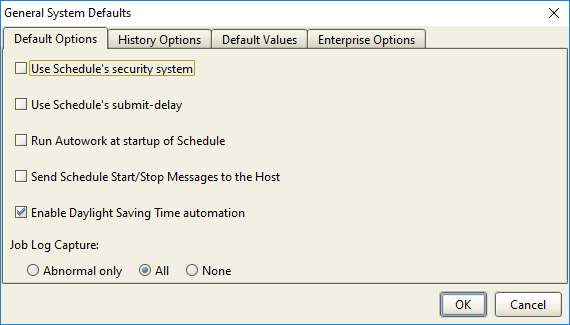 If your system uses QTIMZON but you do not have the GUI option, Robot Schedule will have to be stopped and restarted in order to reflect the time change. Because Robot Schedule must be inactive while any changes are made to the system date or time, we suggest you set up two Robot Schedule jobs to end and restart the product around the time the operating system changes the system time. The examples below shows how you might define the Robot Schedule jobs for the Central time zone. If you do not want the operating system to change the time, set the QTIMZON system value to a value that does not change for daylight saving time. The online support topic for Robot Schedule called “Using Robot Schedule to Automate Daylight Saving Time Change” describes how you can use a CL program in Robot Schedule to change the system time.